Sangiovese, the informing grape of Chianti wines, is a red-wine grape originating in Italy, probably from the Roman era, and possibly in the region of Tuscany. Today, it is grown throughout the wine-making world, but the foremost specimens are still held to be those from Tuscany. • Montalcino - Brunello di Montalcino is the big brother here, and the most esteemed Sangiovese wine out there; its little brother is Rosso di Montalcino. • Montepulciano - Vino Nobile di Montepulciano is the big brother; its little brother is Rosso di Montepulciano. 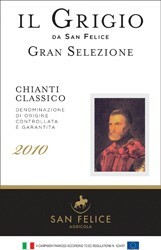 • Chianti - used to come in two classes, normal ("Annatto") and Riserva, but there is now a third atop those, Gran Selezione; note especially that unless a Chianti is labelled "Chianti Classico", it is a pale imitation made outside the heart of the Chianti appellation. • Carmignano - Carmignano wines included admixtures of non-Italian grape types—notably Cabernet Sauvignon—long before any clever winemaker dreamed up the designation 'Super Tuscans"; their "little brother" appellation is "Barco Reale". 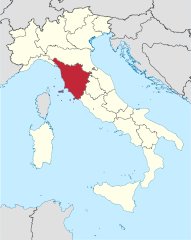 Note: "Montepulciano" is the name of a town; do not confuse Vino Nobile di Montepulciano or Rosso di Montepulciano with the wine type named "Montepulciano", which is no relation to Sangiovese (that wine is usually more fully labelled as "Montepulciano d'Abruzzo". Sangiovese is a wine for which the particular clone used is especially important, and there are fourteen recognized clones. Brunello is one such, and probably the most prestigious (and hence expensive); Prugnolo Gentile and Sangiovese di Lamole are other respected clones. Though Sangiovese is, as noted, now widely grown, perhaps the only area outside Italy to produce competitively excellent bottlings on a widespread basis is Washington State, which has the needed climate plus a dryness that minimizes Sangiovese's vineyard tendency to rot (owing to its thin skins). There is, though, also some respectable product from California, where Italian varieties are enjoying renewed interest. In Italy, Chianti was long regarded as a poor type of wine, and Americans of a certain age will remember the inexpensive and usually dire specimens that came (and still come) in straw-wrapped flasks. Nowadays, while cheapo Chianti is still made and sold, the overall quality level has soared (and the bottles are normal). Sangiovese wines are typically somewhat light in color and in body, and fairly acidic. Newer vinification techniques have added some body weight and "texture" to Sangiovese, and so has judicious use of oak aging. Carefully chosen subsidiary wines used in blends also make for excellent results, though care has to be taken not to overwhelm the Sangiovese nature. Older "classic" Sangiovese wines show distinct notes of cherry, especially bitter cherry, plus herbal overtones. More modern versions tend to show much more fruit, with darker "purple" qualities (plum, mulberry), as well as the typical red-wine complexities such as tar and tobacco. Factoid: The grape name Sangiovese derives from Latin sanguis Jovis, "blood of Jove". Some reckon that it was first cultivated by the Etruscans. "Young Sangiovese has fresh fruity flavors of strawberry and a little spiciness, but it readily takes on oaky, even tarry, flavors when aged in barrels. While not as aromatic as other red wine varieties such as Pinot noir, Cabernet Sauvignon, and Syrah, Sangiovese often has a flavor profile of sour red cherries with earthy aromas and tea leaf notes. Wines made from Sangiovese usually have medium-plus tannins and high acidity.…Blending can have a pronounced effect on enhancing or tempering the wine's quality. The dominant nature of [often-used] Cabernet [Sauvignon] can sometimes have a disproportionate influence on the wine, even overwhelming Sangiovese character with black cherry, black currant, mulberry and plum fruit. Even percentages as low as 4 to 5% of Cabernet Sauvignon can overwhelm the Sangiovese if the fruit quality is not high." 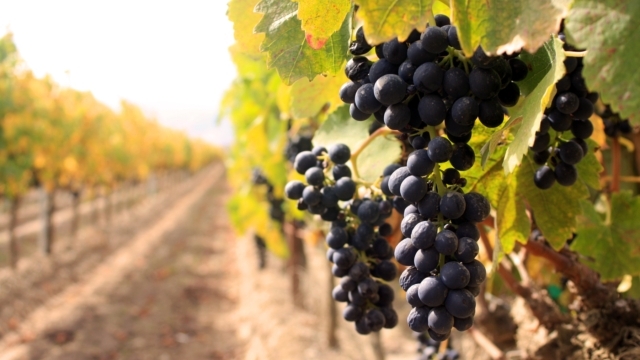 "Typically Sangiovese grapes make medium to full-bodied wines with tannin structure ranging from medium-soft to firm. Dominant flavors associated with Sangiovese derived wines include: cherry, plum, strawberry, cinnamon and vanilla. There is often a herbaceous quality associated with Sangiovese wines. As for acidity levels, Sangiovese leans towards medium to high acidity content. The finish can range from elegant to bitter." "Good-quality Sangiovese is prized for its high acid, firm tannins and balanced nature. Savory flavors of dark cherries and black stone fruit are characteristic, and may be backed by secondary notes of tomato leaf and dried herbs. The use of oak has become more popular and this coaxes richer flavors from the grapes, tending toward plum and wild raspberry." "Sangiovese is a versatile grape that spans the entire length of the quality spectrum, from low-end Chianti to top-shelf Chianti Classico.…Brunello di Montalcino [is the] highest expression of Sangiovese; made exclusively from the dark Sangiovese Grosso clone, it shows beautiful richness, intensity and complexity, with aromas of forest fruit, cola and spice. Brunello is released five years after the harvest and the Riserva requires an extra year of cellar aging. . Once the noblest of all Tuscan wines, Vino Nobile is made with the Prugnolo Gentile clone. The wine is minimum 70% Sangiovese, with components of Canaiolo Nero and Mammolo. This region also offers a lesser wine called Rosso di Montepulciano and a top-shelf Riserva. The wines show dark, earthy characteristics, often with subtle overtones of dried herbs or blue flowers." "As Sangiovese is a fairly delicate variety in terms of the fragrances and flavors it offers, what ends up being added makes a major difference in the final profile of the wine. Climate and altitude also influence the nature of Sangiovese-based wines; wines made in hotter, drier parts of Southern Tuscany are fleshier than wines made in Chianti and other cooler, higher areas. With lesser clones and viticulture, Sangiovese tends to produce tannic wines, without great color. 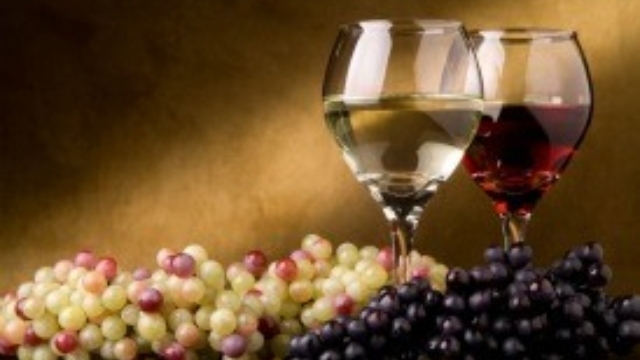 The best examples are highly aromatic, fragrant wines with nicely integrated tannic structure. If you are looking for wines that are 100% Sangiovese, your best bet are the wines from Montalcino, a pretty medieval hilltop town 25 miles south of Sienna. Here, wines are made from the Brunello grape, also known as Sangiovese Grosso, an especially high quality (and large) clone of the Sangiovese grape. These full-bodied and powerful wines, labeled Brunello di Montalcino, rank with Barolo among Italy's most-ageworthy wines. Rosso di Montalcino, also grown in the same town, is also 100% Brunello, but results in a softer, fruitier wine that requires much less aging." "All that said, there are indeed common links in character across clonal variation. Sangiovese tends to be rather lightly-pigmented (the Brunello clone being a notable exception) and the wines -- even younger examples -- often cast a slight orange tinge at their margin in the glass. This characteristic can be a sly clue to experienced brown-baggers in blind tastings. Pronounced acidity is also an important common characteristic across clonal variation and even the most structured of Sangiovese wines have a firm acidic backbone. Other common descriptors for the aromatics of the variety often include prunes, dark cherry and earthy barnyard." "The Sangiovese grape is a bit of a chameleon; easily altering its genetics to fit the environment. There are many different mutations of the variety all over Italy, which results in very different tasting wines. From the delicate floral strawberry aromas of Montefalco Rosso to the intensely dark and tannic wines of Brunello di Montalcino, Sangiovese wine has something for everyone.…FRUIT: Tart Cherry, Red Plum, Strawberry, Fig. OTHER: Roasted Pepper, Tomato, Leather, Clay, Brick, Tobacco, Smoke, Oregano, Thyme, Dried Roses, Potpourri. OAK: Yes. Usually light oak aging in neutral oak barrels. TANNIN: High. ACIDITY: High. AGEABILITY: Yes. 4-7 years (normal) & 10-18 years (Brunello di Montalcino).…Sangiovese is savory. Because of its ability to be a chameleon, Sangiovese wines offer a wide range of tastes from very earthy and rustic–as is the case with many Chianti Classico–to round and fruit-forward. Regardless of where it’s grown, it always exhibits cherry flavors with more subtle notes of tomato. They next time you try a Sangiovese, dedicate yourself to sit and sniff it for a while. Over time you’ll find that aromas move towards dried cherries, figs and roses–especially if the wine is older." "Throughout Tuscany, Sangiovese produces wines that are crisp and lively with savory, cherry fruit flavors and soft to ripe tannins. The refined red-fruit flavors of better quality Sangiovese also contain complex flavors of earth, tobacco and coffee." "Italian Sangioveses have vibrant acidity and substantial tannins, along with fresh cherry fruit and herbal scents. New World versions tend toward softer acidity and fleshier fruit." "Bright aromas and flavors of raspberries and strawberries with typical racy/lean acidity and mild tannins predominate in the lighter to medium-bodied Sangioveses. Darker, more robust and extracted wines with wild raspberry and violet nuances generally originate from cooler growing regions. Moderate tannins add to the fruitiness and naturally high acidity and give the wines additional complexity and length. The lighter styles of Sangiovese are best consumed within three years of their vintage. The bigger wines will improve for a decade as the aroma evolves to a complex bouquet of faded roses or violets, coffee, leather and cedar. The wine goes from bright deep garnet to a more brick-red. It softens and takes on a velvety texture with a rich, multi-layered complexity that echoes the nuances of the bouquet." We have tried here to present samples of pretty much the spectrum of Sangioveses, but it is impossible to find a decent or better true Brunello for under $20, so we had to omit that category. Moreover, we agree with Eric Asimov of The New York Times: "[W]hile the current rules require the blend to include 80 to 100 percent sangiovese, that remaining 20 percent can also consist of international grapes like cabernet sauvignon and merlot. Even that small portion can dominate a wine to the detriment of its distinctiveness." So we have omitted Chianti blends in favor of 100% Sangiovese Chiantis (which cut out quite a few bottlings, hence the brevity of this list: good-quality 100% Sangiovese is not common at under $20). ♦ This is a bright selection, showing wild cherry, leather and balsamic notes alongside hints of well-integrated oak, pepper and espresso. It's not complex but it has a silky texture and is enjoyable now. 89 points. 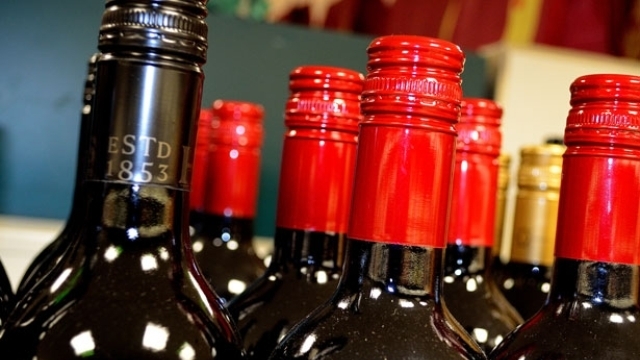 ♦ A warm and dark cherry red in colour, with altogether pleasant fruit aromas, tinged with an attractive earthiness. Medium-bodied. Light and lively, with an edge of tannic minerality. Possesses a charm, a sunny acidity, nicely contained. Drinks very well indeed throughout an evening. San Felice Chianti Classico "Il Grigio"
♣ There is room for confusion here, owing to the new official Chianti category of "Gran Selezione", which supposedly sits atop the former acme, "Riserva". San Felice's "Il Grigio da San Felice Chianti Classico" seems to have become bifurcated with the 2010 vintage, some being of the new "Gran Selezione" category (expensive) and a continuing "Riserva" bottling. Pricing and quotations apply to the Riserva; mind the labels, and caveat emptor. ♦ Hallmark Sangiovese aromas of blue flowers, woodland berries, underbrush, leather and spice take center stage in this stunning wine. The palate delivers succulent black cherry flavor accented by black pepper, cinnamon, mint and sage, with bracing yet ripe tannins. It’s already delicious, but hold for additional complexity. Drink 2015–2025. 93 points. ♣ Wine Advocate (29 August 2013), 93 points. ♦ A pure expression of Sangiovese, the 2009 Chianti Classico Riserva Il Grigio shows the inner warmth and richness that is characteristic of the Castelnuovo Berardenga subzone of the famous Tuscan appellation. Balsam herbs and eucalyptus oil appear at first and slowly give way to black fruit, cherry cola, violet and Spanish cedar. It shows an extremely polished feel in the mouth. Anticipated maturity: 2014-2028. ♦ The nose showed animal musk and dusty black cherry. On the palate, I found vibrant strawberry fruit, spice and earthy minerals. This wine is well structured and has great balance. It was a pleasure to drink. 91 points. ♦ Lead pencil and slightly dusty black fruit, with a certain crunch on the palate. Very nice length and a freshness. 90 points. 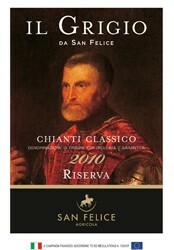 ♦ In the glass, this San Felice “Il Grigio” Chianti Classico is deep ruby with a hint of garnet. Moderately intense at the centre of the glass it fades to a lighter, more pale tawny colour at the rim with a hint of rusticity (a hint of Tuscan earth) showing this wine’s time in oak at the rim of the wine. Alcohol is light by comparison to some of the varietal Sangiovese wines coming out of Tuscany these days (some of which reach 15% abv), but this Felice “Il Grigio” Chianti Classico is perhaps only half a percentage point under the norm for wines made under the Chianti classification, weighing in as it does at 13% abv. More forward and riper in its aromas than some Chianti, this Felice “Il Grigio” Chianti Classico shows straightforward (but perfectly balanced) cherry notes (never too sweet or too sour) along with a whiff of dried earth as the bouquet initially wafts from the glass. With further time and air, a hint of leather and tobacco arises to add further complexity. A more modern style, this balanced set of characteristic make this Felice “Il Grigio” Chianti Classico much softer on the nose than some more austere and bitter “old” styles of Chianti. In the mouth, this more open and modern style is continued with this Felice “Il Grigio” Chianti Classico showing an enviable length of those balanced and ripe cherry flavours. At the onset seeming a little thin, the medium bodied weight of this wine really appears in the mid-palate with the fruit flavours suddenly thickening and becoming more complex. A conveyor of velvety tannins brings weight, nuances of leather, chestnut and a hint of dried violet. This Felice “Il Grigio” Chianti Classico is an accomplished Chianti Classico which ends with a trademark twist of bitterness and a suggestion of dried orange peel. On the whole, this Felice “Il Grigio” Chianti Classico is a highly accomplished wine. Unlike some top producers of Chianti, San Felice have not smothered their Chianti Classico Riserva in oak (one of the most consistent problems with Chianti “Riserva” is that you never know how obvious the oak will be when drinking the wine). A balanced approach to oak in the cellar (the mix of origin and size of oak used to age the wine) has resulted in a balanced wine in the bottle and the glass. Tamed tannins result in eminently enjoyable and drinkable Chianti which is worthy of its place alongside any traditional Tuscan plate of braised pork or a mature and tangy cheese anytime. 87 points—A Chianti which oozes class! ♦ San Felice’s wine Il Grigio embodies to the fullest degree the qualities of Sangiovese as they are expressed in the unique terroir found at San Felice. ♦ Somewhat backward. Sweet, ripe, and dark fruit (more open on the palate than the nose suggests). Cherry and plum, firm acidity and ripe, rich, yet dry tannins. Very good length. ♦ Lively cherry ruby with black reflections and cherry rim. The bouquet is fairly rich, with cherry fruit supported by deft slightly dusky cedar and some savory spice, also slight peppery accents and a certain airiness from alcohol. On the palate it's ample, with fairly sour cherry fruit supported by moderately intense sour berry fruit acidity that has some leatheriness to it, and by warm rather balsamic tannins that flow into a fairly long balsam laced finish. It has a tired feel to it, and I would have liked more depth and richness to the fruit. ♦ While the aromatics conjure a juicy, fruit-forward Chianti, the mouth is something else: lean, focused, with tannins that grip your tongue. Herbal notes, leather and a distinct gamy note. So interesting, and it will get even more so in a few years. ♣ Though a lot of the comments quoted below happen to refer to the 2013 vintage, which apparently was even better than usual, critical response to other vintages of this wine was also quite strong. ♦ [I]ts color is garnet and it is fragrant with strawberry and leather on the nose. The strawberry continues on the palate along with rose petal, red raspberry and cherry. A hint of oak adds depth to the wine’s delectable flavor profile, which leans more towards fruity and less earthy, with medium tannins that do not overpower. Though the finish is not interested in lingering too long, the wine ends on an elegant note. Up to an hour’s decanting benefits this (and most) Chianti greatly. ♦ Dark berry, underbrush and tobacco aromas lead the nose of this vibrant, structured wine while the palate doles out black cherry, fresh raspberry, licorice and clove. Fresh acidity and supple tannins balance the juicy flavors. 92 points. We do not normally list wines chiefly or solely available from the winery, but Caparone Winery has earned entries here for each of the half dozen varietals—Cabernet Sauvignon, Merlot, Zinfandel, Sangiovese, Nebbiolo, and Aglianico— that they bottle, so ordering a mixed case or half-case is both reasonable and economical. This is one of the most undeservedly little-known wineries in the country, chiefly because Dave Caparone only bottles about 3,000 cases a year and disdains advertising and competitions. ♦ The Caparone winery prides themselves on a minimal intervention approach to winemaking. 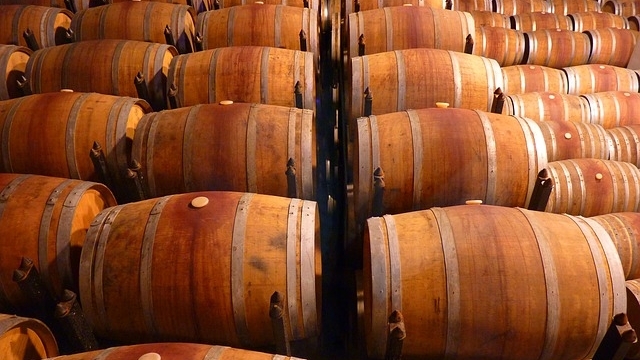 They don’t fine or filter any of their wines, techniques that are employed by the majority of wineries throughout the world to give the juice a clearer appearance. The main reason behind fining and filtration is to keep the public happy, and not freak out that their wine is cloudy. Some winemakers argue that fining and filtration strips a wine of its flavor.…The back of the bottle states that this wine will cellar for another 25 years or more, which blew my mind a little bit when I read it! Unfortunately I’m not hanging on to any long enough to find out.…I’m not going to pretend that this is the first time I have tasted this wine, I’ve been a fan since it graced my lips a little over a year ago. It’s unlike any other wine I have ever tasted, in a good way! Pale crimson in appearance, the nose explodes with complex spices of cinnamon and clove, and shows bold red cherry and dried cranberry. On the palate the bold red cherry continues, with distinct ripe raspberry and the cherry turning slightly sour with herbal notes on the lengthy finish. Tons of character and definitely decant an hour before serving. ♦ The brunello [Caparone's former designation for their Sangiovese] has unmistakable tobacco tones with cinnamon coming in late. Unfortunately there were no examples of their '88 or '89 vintage so there was little to compare it with. We also tried the '92 and '93 from the barrel and these had very good legs even after less than a year in oak in the case of the '93. This 'brunello' is certainly not (nor will it ever be) a Poggio Antico or an estate-bottled Caparza, but in a decade I think the '91 will be great drinking. ♦ It’s worth noting [in 2007] the vintage: 2002. This is the current release for this wine. Brilliant. A beautiful, milky/cloudy brick red struck fear into my drinking companion, but I was hooked on sight. This is an unfined and unfiltered wine. The color is alluring and seductive and coos out for attention. My Riedel (yup, snob) opines “cooo come hither.” The nose is REALLY exciting. Pungent, with deep dark fruit, and wet earth. Mossy, maybe? A few broken pine needles? A sprinkle of cocoa powder, and a wild underlying black & white pepper. But each time I go back in to exactly pinpoint the spice, it changes. Wow. And the wine smells healthy. I don’t have a way to further describe “healthy” to you, it’s just something that hits me sometimes. Rarely, actually. This is the beauty of wine however: it’s subjective. You can’t be wrong! (And neither can I, yeehaw!) In the mouth: a buxom medium, or slender full body. Mellow tannins don’t punch you in the face or make your teeth have immediate sweaters. The wine has a zest that makes the glands salivate in a healthy manner. Again, wow. This is a seriously great, great, great wine at this price. In fact, I’m going to a food/fun gathering tomorrow where I know no one, and this is the bottle I’m bringing. Hooray! Hooray! A bottle to really enjoy for $12! ♦ This is their sangiovese, old school and unblended. Smell it: flowers, earth. Taste it: light cherry. More earth. For $15 bucks you can drink it every day and with less than 14% booze you can drink it all day long. Pair it: (and no we aren’t gonna just say pasta and pizza) Thai style bbq ribs, albondigas soup, roasted golden beets. Goat cheese. Ancient balsamic. What else do you need? A recognizable rating? How’s this for a recognizable rating? It’s beautiful, beautiful, just beautiful. Yes. We Rate This Wine: Sunny Corleone. Get. Some. ♦ His 1986 Sangiovese was the first grown in the United States. And bottles from a more recent year were on hand for our swilling-pleasure. This velvety red started with the taste of melting chocolate and finished with a divine spread of raspberry as it swirl before heading reluctantly down my throat. I was now officially in love. Husband was happy for the outcome and instantly ordered up a couple more glasses. ♦ This Sangiovese is a nice spicy medium-weight wine that will match very well with red sauced Italian dishes, sausage, and many other dishes. The wine is bright and fruity and I found it to be very pleasant by itself, but salivating for some sausage bread buried in a nice marina sauce. I'm probably going to sit on this one for a year or two, not because I think it needs it, but more because I'm sure the wine will hold up well, and it will be interesting to see how it further matures in the bottle. Caparone claims the first Sangiovese in in the United States, with their first vintage in 1986. Their experience shows. ♦ This past fall, I had a major hankering for Sangiovese that went unsatisfied until one snowy night last month when I happened into Webster's and discovered that Sangiovese was their December feature. The 2004 Caparone was the standout from the flight I had that night. I never knew a Sangiovese could have so much character. ♦ I really think that all of the wines of Caparone in Paso Robles are exactly that ["wines in the $20 range that offer character and value"]. They’re all often under $15, and have been for quite awhile, which is a big statement coming from a small family-run winery (not a trust-fund or second-career winery). Let me just say that a $15 Sangiovese made from cuttings of Il Poggione’s Brunello vines is one of the best deals in the wine world, not just California.…And if you join their wine club you get them for even less! Please, don’t tell everyone–I want to keep these wines for myself. As a compromise between average reviewer scores and average price, we will point to the Podere Poggio Scalette Il Carbonaione Alta Valle della Greve bottling.